We have been conducting numerous insecticide trials at RAREC against BMSB in peaches (Encore variety). In particular, we are evaluating the efficacy of a a single insecticide sprayed on a 10 day schedule to see if we can identify differences in effectiveness of selected insecticides throughout the season. I understand that growers will not (and should not) spray the same chemical throughout the season but it helps to isolate the effect each chemical. This is complimented by laboratory trials using field collected bugs. Because of limitations in the number of applications for certain chemicals I feel that this is an important component to developing IPM programs in NJ. 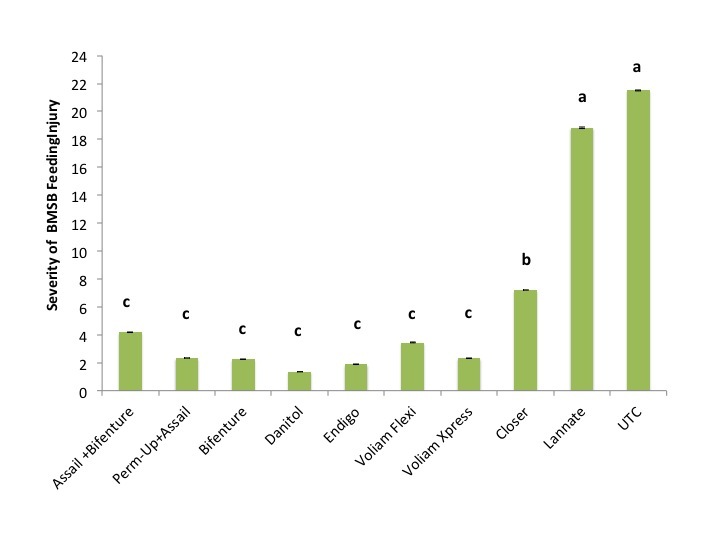 We have evaluated Lannate LV, Bifenture (Sect 18 only), Bifenture+Assail (Sect 18 only), Assail+Perm-Up, Voliam Xpress, Voliam Flexi, Danitol, Endigo and Closer. Closer is a new neo-nicotinoid like compound (IRAC Class 4C) from Dow AgroSciences that is effective against green peach aphid. Because of its potential importance as a resistance management tool, we included this in the evaluation. What we have seen suggests that Perm-Up+Assail and Danitol are more effective early season but Bifenture and Voliam Xpress have not decreased in effectiveness from end of May to now. This suggests that for those chemistries, it would be best to use Perm-Up or Danitol early in the season against the adults that are just emerging from diapause and migrating to the orchard. From the fruit injury data, our data strongly suggests that Lannate is not an effective compound against BMSB. Closer performed ok, there was a lot of fruit with injury, but the injury was not severe. 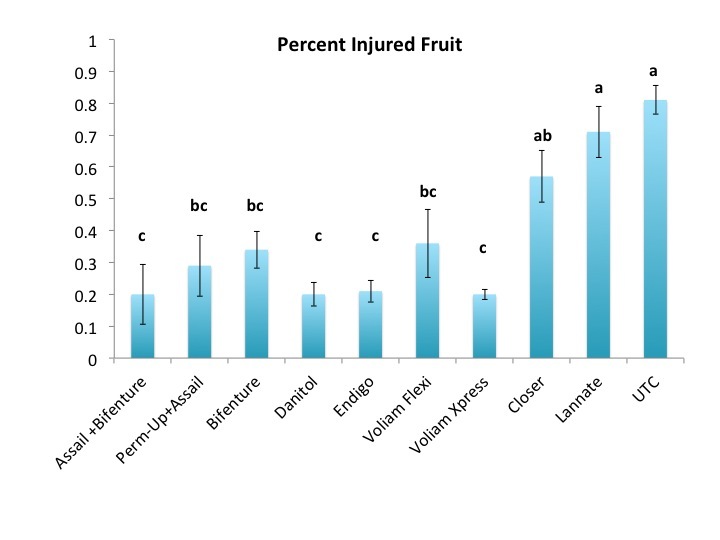 Danitol, Voliam Xpress, Assail+Bifenture and Endigo had the least percent injured fruit. Keep in mind that Bifenture/bifenthrin is ONLY allowable on peaches and apples with a Sect. 18 which we do not have yet!! Danitol has been very variable in previous studies, but is performing well this season at RAREC. Voliam Flexi, Assail+Perm-Up and Bifenture alone also significantly reduced injury. Assail by itself has not performed well against BMSB in previous trials. Feeding severity was significantly reduced for all insecticides other than Closer and Lannate, although Closer was better than Lannate. Bifenture causes 100% mortality in the lab so my guess is that in the field it may not have as long of residual but once available, it will be a great addition to use and will cause mortality of BMSB present in the orchard. Please keep in mind that the BMSB pressure at RAREC is very high! Always follow label instructions.